2016 UPDATE: We now have 2016-2017 First Day of School Prints in our Etsy shop! It comes with all grade levels ready to print! Grab yours here: First Day of School Signs. Due to extreme high demand of customizations and requests, we had to add them to our shop. Thanks for your understanding! Hi friends! Who’s ready for school to start? MEEEEE!!!! My kids are excited too but I am really excited to be back on a schedule. Type A + Summer vaca and no structure = crazy town! I have your Back to School Free Printables for this school year again for you! I have 2 little ones in school this year and two at home so it’s going to be a big change in our house. We’re gearing up for the first day! I took some fun pictures of my boys and my nieces to document their big day! I can’t believe some kids have already started! Click the links below to download and print! Here are some general First Day Printables without the grade. NEW!!! If these signs don’t work for you or you want to change ANYTHING at all, you can purchase the EDITABLE version on our Etsy shop! 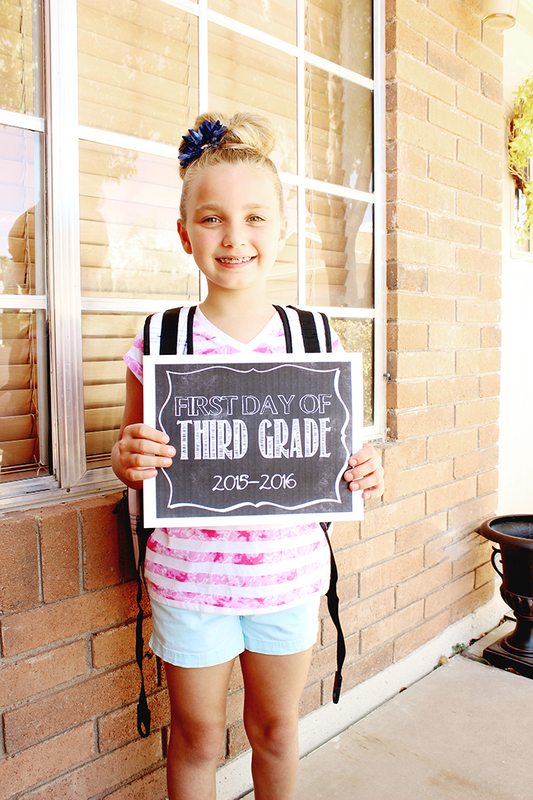 Purchase here: Editable First Day of School Sign. Please note this is for PHOTOSHOP users only. You can also purchase the full range of grades for 2016-2017 here. Thank you, thank you, thank you so much for making these printables! I used them last year and thought I wouldn’t be able to find them again this year. You are helping me make special memories with my two girls. You’re so welcome Jessica! Happy Back to School!! Thank you also, I used this last year with my son going to Kindergarten and I came in tonight to see if it was there this year as school begins Monday. Thank you for making my childs milestones so precious. Please disregard my previous email because I obviously found the printable on your website. Thank you so much for creating the 2015-2016! Too cute! Thank you so much for these printables! I used them last year too and just love them!! Thanks pretty lady! Third year in a row. Also considering I just had a newborn, you’re planning on making these for me for the next 18 years right?? Hope your move went great and that you’re loving being closer to home. I have used these the past three years!! Thanks you so very much!!! Cheers to the new school year. I came across these and I absolutely love these, but I cant seem to get it to print, please help my son starts school tom. Thank you so much for these! They are super cute. Could you do the preschool one?????? 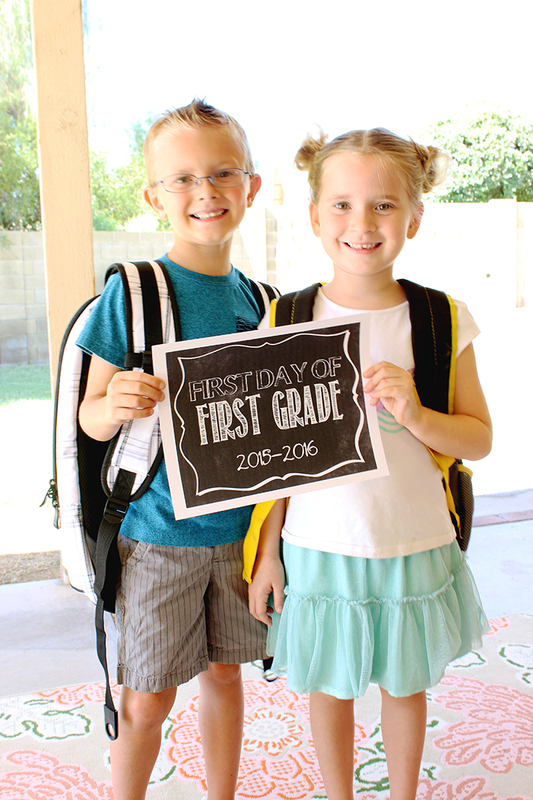 I found your site for first day of school printable pictures. I love them! 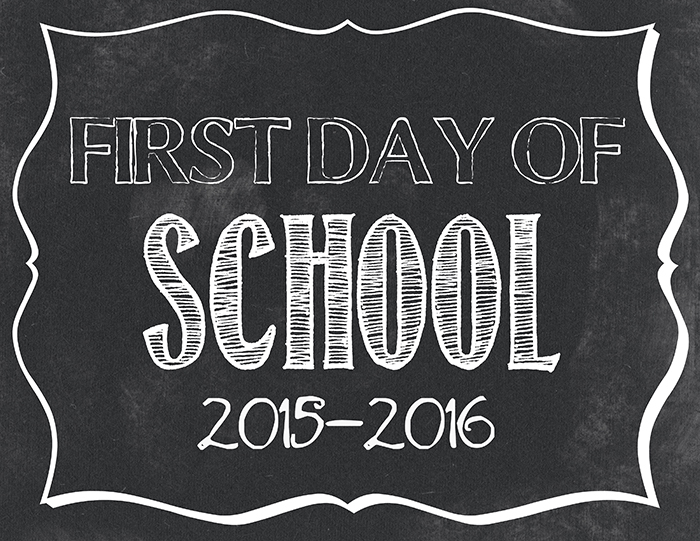 However I can not seem to download the one at the top of the page that is simply “first day of school 2015-2016” is there a link to this printable? I like to do a general one for all the kids together. Thank you. Thank you for making these again this year! I’ve used these since my son started Kindergarten in 2013! I’m so glad I can continue to use them for each year he’ll be in school! When I print this out, it cuts off one side of the page. Am I doing something wrong? How should I fix it? Thank you so much for making these available! I came back from last year. Super cute! But when I go to print these on Letter size paper…the borders get cut off. Any ideas how to solve? HI Deanna! I emailed you some tips. Hope that helps! Any tips on sizing this down? Last year they were jpg’s so I was able to print them a tad smaller (so they fit in the 8×10 frame I bought), but as a PDF I can’t seem to figure out a way to print it a tad smaller so the scroll border doesn’t get cut off. Hope you see this today – I need it ready to go tonight! I love these! Thank you so much for creating and sharing them! I may be missing it on the website, but last year there was one that just said First Day of School that could be downloaded. I see it on the website but not one that I can download. Is that still available? Thank you!! Hi, I’m trying to print out the 1st day of Kindergarten 2015-1016, and I chose the landscape view, but all it prints out is a sheet of black with no writing. Any suggestions as to what I am doing wrong? Thanks! I’m so grateful for creative and computer savvy women such as yourself! Using the “first grade” printable for my daughter’s first day tomorrow. Thanks again! Do you have the .jpeg forms of these? I just can’t seem to get the .pdf version to print right. Thanks! Really like the print outs – would love if there was one for the first day of nursery school. Hi! was wondering how i could print the first day of school printable, without the grade. I wanted to purchase your “first day” printables but it says it’s no longer available?! We will have them available a few weeks before schools for 2016-2017!! Hello, Love your signs and have been using them for three years! Thank You! Do you have the 2016-2017 school year ready?!? The pictures that were taken of those kids looks quite impressive. I’m guessing that the work of the professional photographer sure was pretty tough especially in keeping the glare of the sun out. It’s something that I even have trouble when taking the perfect picture on my camera. Hi! Love this printable – I used it for my twin boys’ first day of Kindergarten. Was wondering if you’ll have last day of school printables for 2015-16? That would be wonderful!!!! We are starting pre-school mid-term tomorrow and I would like to have these to use for the rest of our school years! The ETSY link is no longer available, will you have the editable version up again for sale for the last day and first day in the fall? I too am having difficulties sizing this for an 8×10 frame. Our back to School printable will be available a few weeks before school starts for 2016-2017! School starts here August 9, do you think they will be available before then? Are you making these available for this year? I’ve used them for the past few years and would love to carry on that tradition! I used this for my daughter’s first day of school and need the same one for the last day, but I don’t see the 2015-2016 last day. Am I missing it somewhere? Thanks so much! Wondering if the last day of school sign will be available soon? This came in such handy and I would love to re-create his first day picture! Thank you! Hi! We’re planning on releasing it soon! Keep an eye out! Hi!! I love love your site! And these printables! My son’s last day of school is today, and I would love to recreate his first day picture! Will you be releasing the last day printables?! Thanks so so much for these! I love them! Good morning ladies! Just checking in to see if you have released the last day of school signs for 2015-2016 yet? I used your sign last year and the pics turned out so cute! Thanks!! I love these signs! I used them for my daughter’s first day in August. Can’t believe the school year only has one more week. I don’t know if you have already, but are you guys going to do the coordinating last day of school signs? That would be so awesome! You guys are great for doing this. Thanks so much! Will you be doing the editable version on your Etsy shop again? I tried to click on the link and it wasn’t in your shop anymore. Thanks so much for making these cute signs! I love the memories they create! I tried to buy your editable version from the Etsy store and it said it had been removed…..will you be putting that back up? I love these and how they look. My son loves to take his picture with these. Thanks so much for sharing! Sorry I posted this twice. I couldn’t find my original and so I thought it hadn’t posted. Just wondering if the last day of school signs will be available soon. My son finishes kindergarten soon and I would love to print a sign to match the one he held for his fort day of school. Thanks! Used your signs for First Day of School, and my daughter ends preschool on Thursday. I can’t seem to find the Last Day of School signs for 2015-2016. Are they/will they be available? Hi! My 4-year-old little guy finishes preschool tomorrow and I was wondering if you had the last day of school printables available either for free or for purchase! Thanks so much! We do these every year and I just love them! Thank you for these signs! They are great! My kids start school the first week in August, will you be making them for 2016-17? Any chance you will be creating the signs for the 2016-2017 dates? LOVE your signs! They are the best I have seen! Are you making them for the 2016-2017 school year? I was wondering the same thing for 2016-2017. School starts here on August 15th so I went looking today. Thank you! Hi! I would love to use this cute sign for 2016-2017! Will you be releasing the dates for this school year? Will you be making these for the new school year? I need to print them this week!!! Pretty please!! Love these, we have used them the last two years!! Are you doing them for 16-17? I have used these for the past two years and they are a great part of our family tradition. Will you be releasing any for the 2016-2017 school year? We would really appreciate it! Are you doing 2016-2017?? I loved your sign from last year! Good afternoon, any chance you will have a free version this year? Also, the one in Etsy is not editable, is that correct? Hi! We offer an editable Photoshop version or ready to print signs for 2016. I love these signs! We’ve used them every year and have become tradition as well! I definitely don’t mind paying, but have you considered making a “lifetime pack” of Kindergarten-College? I know it sounds silly, but I’d love to have First Grade (2016-2017), Second Grade (2017-2018), Third Grade (2018-2019) etc. I’d print them all at once to make sure I have one for every year! I love your signs and have used them for the last 3 years for the first and last days of school. I don’t mind paying for them, but I think the price is very high for just one sign, especially when I only have one child. It would be great if there was a lifetime pack. Your school signs turned out beautifully. Congratulations on having such a healthy and growing family.